Department of Art | FSU Art BA 16′ Student Allie Hetherington Internship at Pyramid, Inc.
Home » News » FSU Art BA 16′ Student Allie Hetherington Internship at Pyramid, Inc.
FSU Art BA 16′ Student Allie Hetherington Internship at Pyramid, Inc.
My internship at Pyramid, Inc. pursuing art therapy has been one of the best decisions of my college career. As a senior studio art major with a minor in psychology, my goal for this internship is to make connections with the staff at Pyramid, Inc. I plan to use these as references for my future career and work with students by creating art as a way to cope. Growing up with a sister who has Down syndrome exposed me to a background in understanding different disabilities and seeing past them. This internship has given me the chance to use my skills to expand beyond my comfort zone and use art as a therapeutic technique. 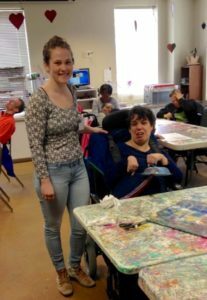 I arrive at Pyramid Inc. every Monday, Wednesday, and Friday around 9:00 AM to the sounds of “good morning” and “I missed you, how are you?” Then, I make my way to the art room, which is filled with 6 tables of about 50 students of all ages with disabilities and 6 teachers, one at each table. As an intern, I can float around the room, but I choose to build a relationship with students at one main table. Occasionally, however, I visit with other tables when the teacher has to leave and help another student. The teachers have many responsibilities and are great with the students. Many of the students need help doing basic activities like using the restroom and feeding themselves. Some of the challenges I have faced include communicating with the disabled students and keeping their focus on creating art so that others do not distract them. The students have such big hearts and the staff is incredible for what they do everyday. I was able to teach one class and have a craft of the day to interact more with the students. They have other projects they could have been working on, but they chose to create these jellyfish crafts with me. First we painted paper bowls upside down to the color of their choosing. Some of the students required help with placing paint on the bowl, but lots of encouragement gave them the confidence to keep working. Once the bowls dried we punched a hole in the center of it. I helped them pick out yarn and cut it to create the jellyfish tail. Once they picked out yarn I put a string around the yarn and pulled it through the hole. In excitement the students went around showing off their jellyfish. It was such a rewarding moment to see the student’s joy after making art with me. I know that I will keep volunteering at Pyramid, Inc. after I graduate to stay connected with the staff and the students. For my next project, I want to use my Circus experience to put on a show and an interactive class teaching juggling. I have gathered a few friends who want to perform and interact with the students; I just need to figure out a few more details to make this project happen. I would love to work with kids who are autistic in my next art therapy experience to become one step closer in deciding what specific field I want to work in. 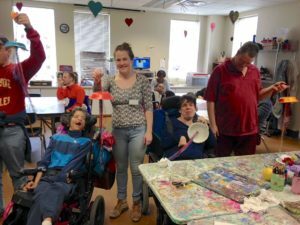 My internship gave me the experience I was looking for during college and confirmed my interest in working in the art therapy field.